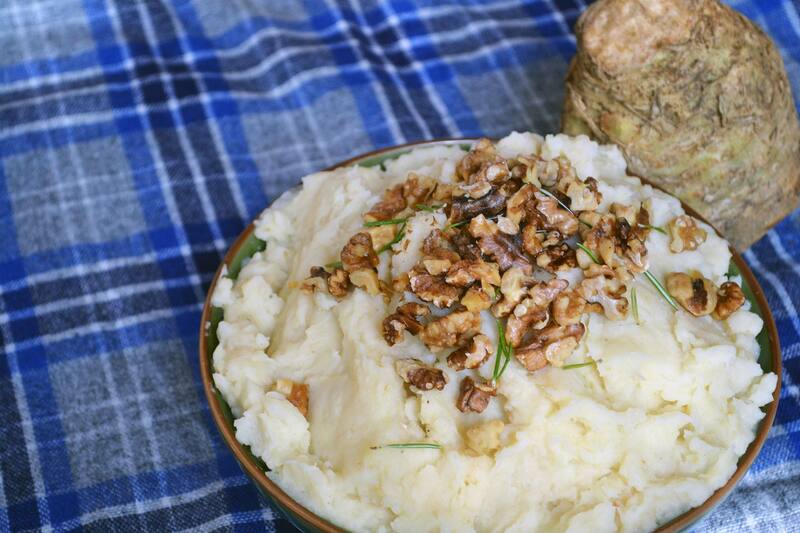 Adding celery root to your mashed potatoes give the mashed potatoes a more complex flavor. It's also a great way to sneak in some more veggies! Bring a large pot filled with water to a boil. Add the celery root and cook for 5 minutes, then add the potatoes. Cook for 15 minutes or until fork tender (depending on the size of the potatoes and celery root, your cooking time may vary). Meanwhile, preheat the oven to 350 degrees Fahrenheit. Spread the walnuts onto a baking pan and drizzle with olive oil. Toss to coat and season with salt. Cook for approximately 5 minutes, or until lightly golden brown. Remove from heat immediately so they don't continue to cook. Remove from heat and drain. Add the potatoes and celery root back to the pot and mash until smooth. Stir in the butter and cream or milk and mix until combined. Season with salt and pepper to taste. Top with the toasted walnuts and enjoy.